If you're scouting for a casual yet totally stylish ensemble, consider teaming a Versace Vintage mid length blazer with green skinny jeans. Both garments are totally comfy and will look fabulous together. Sporting a pair of tan leather pumps is an easy way to add some flair to your getup. If you're on the lookout for a casual yet stylish outfit, make a Versace Vintage mid length blazer from farfetch.com and navy and green plaid skinny pants your outfit choice. Both items are totally comfy and will look fabulous together. If you're on a mission for a casual yet absolutely chic ensemble, wear a Versace Vintage mid length blazer with blue denim overalls. Both items are totally comfy and will look fabulous paired together. When it comes to footwear, this ensemble is complemented nicely with tan leopard suede low top sneakers. If you're in search of a casual yet chic ensemble, dress in a Versace Vintage mid length blazer and black leather skinny pants. Both garments are totally comfy and will look fabulous paired together. When it comes to footwear, this outfit is complemented nicely with black cutout leather pumps. If you prefer a more casual approach to fashion, why not reach for a Versace Vintage mid length blazer and black skinny pants? Sporting a pair of black leather mules is a simple way to add some flair to your ensemble. If you're on a mission for a casual yet stylish getup, team a black blazer with black dress pants. Both items are totally comfy and will look fabulous paired together. When it comes to shoes, this outfit is round off wonderfully with black leather pumps. If you're hunting for a casual yet chic look, wear a black blazer and charcoal plaid capri pants. Both items are totally comfy and will look fabulous paired together. Perk up your look with brown leather loafers. 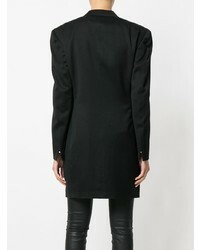 If you're on the lookout for a casual yet stylish getup, consider wearing a Versace Vintage mid length blazer from farfetch.com and black skinny pants. Both pieces are totally comfy and will look fabulous paired together. When it comes to shoes, this getup pairs wonderfully with burgundy leather ankle boots. 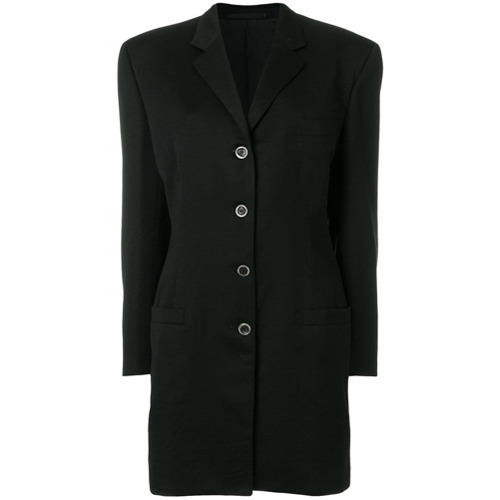 If you're after a casual yet totally stylish outfit, pair a Versace Vintage mid length blazer from farfetch.com with a black coat. Both pieces are totally comfy and will look fabulous together. Black leather ankle boots work wonderfully well with this getup.